If, magically, CO₂ emissions suddenly went to zero wouldn’t emissions of aerosols also reduce drastically and wouldn’t that have a warming effect? In other words, don’t aerosols mean there’s another form of warming pipeline? Ed: Damon has a more recent paper on this, which he included in the talk, but I didn’t have time to write up yet – I’ll do a part 2. The short story is that the aerosols are roughly balanced by the short lived greenhouse gases that are ignored in the CO2 only analysis. Thanks for this clear explanation. But it seems overly optimistic to me. 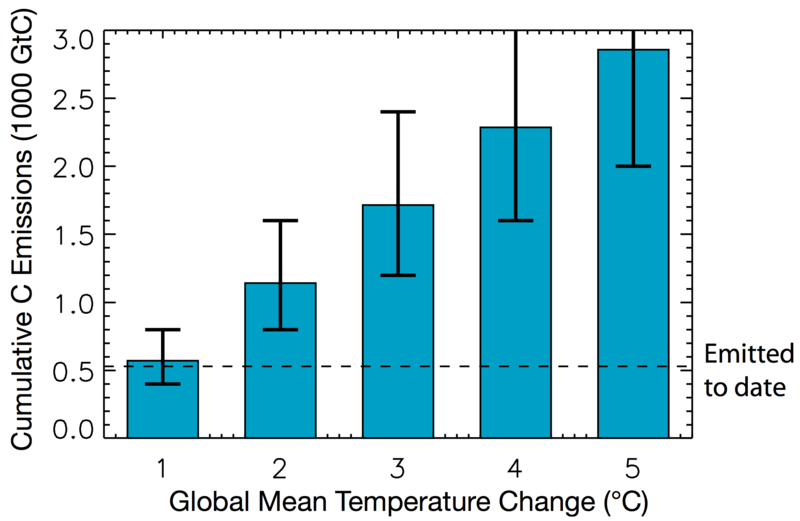 I miss a process that may cause GHG concentrations to keep on rising even if humanity would suddenly stop emitting them: CH4 and CO2 emissions from melting permafrost. Yes, the amount is uncertain, but it is rising fast. And how certain are you that the oceans will keep on absorbing CO2 at the rate they had in the past century? It is more than just basic physics; biological activity matters too, and will be heavily influenced by acidification. Elmar: Thanks – good questions. I’m not certain at all! I’ll try and address this as well in a follow up post, because I asked the same question of Damon at the end of his talk. Both the melting permafrost and the possibility that the ocean will stop being a carbon sink are feedbacks that could mess up this analysis. However, Damon’s response was that these kinds of feedbacks are not expected to become substantial problems until much further on in the warming process. In other words, if we did zero out emissions today, we would most likely avoid these feedback processes altogether. Like you, I’m not quite so convinced. But it boils down to a question of available evidence, and how good we are at anticipating tipping points in these large scale physical and biological systems. Unfortunately, that’s still a very immature science. I think a reasonable position is that such feedbacks are an excellent reason to push hard and fast for aggressive mitigation policies, but probably don’t yet change the judgment that we still have everything to play for. Well…Disappearing Arctic ice was also not expected to become a substantial problem until much later. But it is now. And it speeds up heating of permafrost regions. Looking forward to your next posting! Great post, i’m quite taken by your idea of constant composition commitment. Just wondering what level of annual CO2 emissions this would involve assuming concentrations stay static at say 400ppm. Is it something like 16 GT CO2 a year, or would it reduce if emissions were lower? And if concentrations were maintained around 400ppm, hypothetically of course, do you think land and ocean sinks would degrade, become more effective or be static over time. There was a small discussion about the effects of a “zero-emissions” scenario on temperature rise in the comments section of Climate Progress. Someone suggested I take a look at this post and I’m glad I did. Complex concept, but very well explained. Thank you. Done a little more reading. Can I ask why in ‘Constant concentrations scenario’ the CO2 emissions drop so quickly? Reading the global carbon project it seems that the land and ocean sinks have been absorbing roughly 5 GtC each year over the last decade. Does the modelling assume some type of saturation in sinks? Or is it due a link between emission rates and sinks. It’s because the absoption rate is a function of the emissions rate. 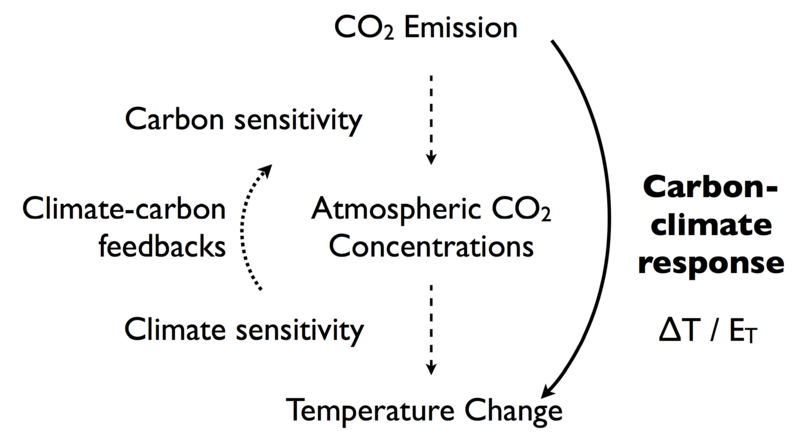 For example, the upper layer of the ocean exchanges CO2 with the atmosphere until they reach an equilibrium. That equilibrium right now is about the point where roughly half of any additional emissions are in the ocean, and half in the atmosphere. So to stabilize concentrations, emissions have to immediately fall to about half of their current levels. But at that point, the ocean uptake is then also halved, so emissions have to drop again by half, and so on. Hence it’s an exponential decay, settling down at the background removal level from very long term carbon sequestration processes. The half-life of this exponential decay is determined by the carbon inertia of the ocean – hence it takes many decades to reach a new (rough) equilibrium. Thanks Steve, that is a really clear explanation. I’d imagine you are a very good teacher. Is that process as predictable with lands sinks? 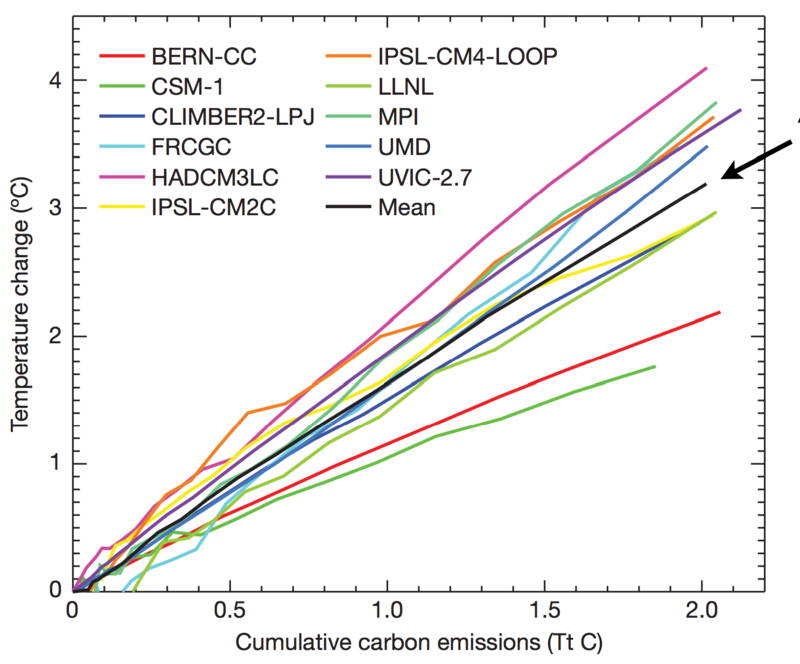 It seems from a reason Hansen note that the land sink absorption is also closely linked to the emissions rate, but process is perhaps less predictable. Lindsay: I don’t know much about the land sinks, but my recollection is that the uptake by the soils is small relative to the ocean uptake, so I don’t think it makes much difference to the curve anyway. BTW when I said “the upper layer of the ocean exchanges CO2 with the atmosphere until they reach an equilibrium”, that might be slightly misleading, because they still go on exchanging CO2 even after that. A better way of saying it is that the upper layer of the ocean is continually exchanging CO2 with the atmosphere, so that if you add more CO2 to either of them, they end up sharing it out roughly 50:50. (That ratio has been relatively stable in the recent past, but might not be robust in the future – as the ocean warms, its ability to absorb CO2 reduces). Thanks Steve, as a layman it is easy to forget about the scale of the flux in the whole carbon cycle and just think about the sink changes. From my understanding the land sinks have actually been responsible for more uptake than the oceans lately. The following link has a spreadsheet showing how much the estimates vary on the ‘terrestrial tab’. Not exactly. Absorption depends on concentration. But if net emissions stop and absorption continues, the concentration doesn’t instantly change, so the ocean keeps absorbing at the current rate and only gradually slows down. “aerosols are roughly balanced by the short lived greenhouse gases” makes sense, but now we are looking at a pretty complex scenario – essentially the “World Without Us” scenario in which humans (and consequently most of our cattle) disappear suddenly. In that scenario I would expect a spike in temperature rising on the timescale of aerosol suspension and declining on the timescale of methane. But I haven’t seen the second paper to which you refer. So here is my gloomy take on this from a couple of years back. Especially in part II, I decided to look at it in the gloomiest way. This neatly separates the optimists from the pessimists; seems consistent with the present article. I am trying to change my spots on the optimism/pessimism axis. So I appreciate the spin. I think the upshot is that the answer depends closely on the way you ask the question. mt: One has to look for optimism wherever one can find it! There’s a nice piece in the intro of Jorgen Rander’s book “2052”, in which he explains that he’s long since stopped hoping that the world would pay heed to the warnings and do the right thing. Then, once he’d come to terms with that, it allows him to celebrate each little sign of sense (e.g. another renewable energy project) as a great thing in its own right, without wallowing in the gloom. The argument about aerosols and shortlived greenhouse gases in the zero emissions scenario is explored in Matthews and Zickfield 2012. Basically, they zeroed out CO2 on its own, and then with each of zero shortlived GHGs, zeros aerosols, and then zero everything. In the zero-everything case, you do gave a short term bump in temperature, but it quickly settles down. One thing that restores committed warming to the zero-emissions commitment paper is the effect of the sulfate aerosols that are co-emitted with fossil fuels, especially coal. When you stop CO2 emissions, you also shut off sulfate aerosols, and the extra radiative forcing from the unmasking of CO2 radiative forcing can lead to growth in temperature past the time when emissions cease. I believe Damon had a short note on this with Andrew Weaver a few years back, plus there’s a nice analysis by Armour and Roe in GRL. Another caveat to the lack of committed warming is that, on the millennial scale, this phenomenon has not yet been much studied in full GCM’s. 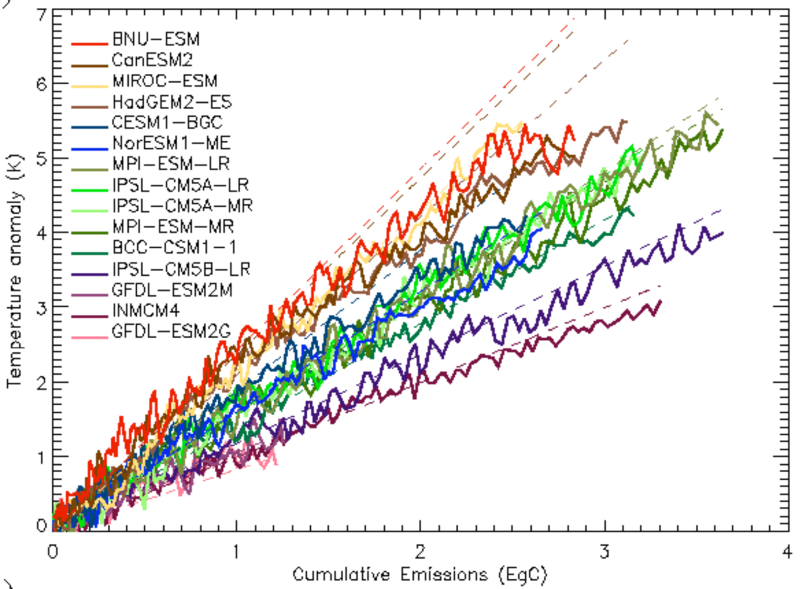 Most of the work on this has been with EMICS, some of which have very poor representations of atmospheric feedbacks. It’s still early days for GCM studies of this sort of thing.